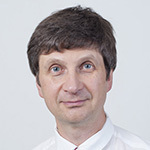 S.L.Dudarev is Head of Materials Group at UK Atomic Energy Authority, and a leader of a EUROfusion Materials subproject. Using a broad range of mathematical methods combined with experimental observations, his group investigates physical and mechanical properties of materials in extreme radiation and temperature environments. S.L. Dudarev was born in Molodechno, Belarus, and studied theoretical and mathematical physics at Moscow Engineering Technical University (MEPhI), receiving MSc (1983) and PhD (1985) degrees in Theoretical Nuclear Physics, and DSc in 1995. In 1989 he was awarded Moscow Komsomol Prize for outstanding scientific achievements in theoretical physics, and a Royal Society USSR Research Fellowship in 1991. He worked at Oxford University, UK between 1992 and 1999, becoming a Fellow of Linacre College in 1995. He is a Visiting Professor at the Department of Physics, Imperial College London, and at the Department of Materials, University of Oxford. Neutrons and charged particles produced by nuclear reactions in the fuel assembly of a fission power plant or in the deuterium-tritium plasma of a fusion tokamak device induce significant changes in the physical and mechanical properties of materials. These changes result from processes occurring at atomic scale. For example, fast neutrons initiate collision cascades, in which radiation defects are formed. These collision cascade events do not change the chemical composition of the reactor materials and give rise only to the formation of fairly stable and relatively well localized distortions of atomic structure; these are radiation defects. These defects migrate, react, coalesce, and grow. On the micro-meter scale, the generation of radiation defects drives a particular type of microstructural evolution, which occurs only in irradiated materials. If the kinetic energy of incident neutrons exceeds a certain threshold, specific to a particular nuclear reaction, neutron-induced transmutations may also occur. In contrast to collision cascades, transmutation reactions modify the chemical composition of irradiated materials. For example, initially chemically pure tungsten bombarded by 14.1-MeV fusion neutrons transmutes into an alloy containing significant amounts of rhenium, osmium, and tantalum. Transmutations also result in the accumulation of helium and other noble gases in the atomic lattice, stimulating swelling and giving rise to embrittlement.Understanding effects of irradiation on materials requires developing multiscale models for microstructural evolution, which describe how the defects evolve and interact, and how the resulting microstructure responds to external mechanical stress or temperature gradients. The key parameters defining the response of irradiated materials to macroscopic engineering variables are the operating temperature, irradiation dose and irradiation dose rate. In this presentation I shall review information about various temperature-dependent properties of candidate fusion materials, in the context of fusion reactor design effort and in relation to recent developments in the theoretical understanding of defect and dislocation microstructure derived from ab initio based atomistic and mesoscopic simulations. This work was funded by the RCUK Energy Programme [grant number EP/I501045], carried out within the EURO fusion Consortium and received funding from the Euratom research and training programme 2014-2018 under grant agreement number No 633053. The views and opinions expressed herein do not necessarily reflect those of the European Commission.